This article is about episode from The Super Mario Bros. Super Show!. For the alter-ego that King Koopa portrays in this episode, see King Koopa's alter egos § Count Koopula. "Count Koopula" is the fifteenth episode of The Super Mario Bros. Super Show!. Its corresponding live-action segment is "Magician". In a dark forest, Mario, Luigi, Toad and Princess Toadstool are running frantically through pouring rain, in a mysterious place called Turtlevania. As she runs, Princess Toadstool complains that she's freezing and wonders whether she, Mario, Luigi and Toad will find some shelter to sleep in. Hearing Princess Toadstool's worries, Mario reassures her, saying a motel of some kind must be nearby. In a nearby dark, castle, Count Koopula is glaring through a telescope at the approaching Mario, Luigi, Toad and Princess Toadstool. Turning away from his telescope, Count Koopula, after cackling to himself, calls Mousigor into the room, telling him to prepare some rooms for the quickly approaching Mario, Luigi, Toad and Princess Toadstool. After giving Mousigor his orders, Count Koopula turns to a nearby pole with a bizarre looking Tweeter Bat hanging on it; waking the Tweeter Bat, Count Koopula orders it to go outside and lure Mario, Luigi, Toad and Princess Toadstool to his castle. Hearing Count Koopula's command, the Tweeter unfolds its bat-like wings and flies outside a nearby window (Count Koopula moves the telescope aside before it flies out), into the stormy night. Under a large tree near some rocks, Luigi is in the midst of trying to get Mario to share some of his leftover spaghetti, which Mario refuses to do; (for he had 3 orders of spaghetti as opposed to Luigi, who only had 1). It is only after some convincing by Luigi and Princess Toadstool that Mario decides to share some of his spaghetti, which he hands to Luigi. Unfortunately, just as Mario gives Luigi his spaghetti, the Tweeter Bat from earlier suddenly dives downward and grabs the box of spaghetti. As the Tweeter Bat begins trying to fly away, Mario leaps through the air and grabs hold of the Tweeter's legs. As the Tweeter Bat begins to soar away with Mario holding on to it, Toad grabs hold of Mario, while Luigi and Princess Toadstool grab him (causing the weight of the latter to literally stretch Toad). Luigi, Princess Toadstool, Mario and Toad's effort to pull the Tweeter Bat down is in vain though, as the creature simply shakes them loose and flies towards the castle of Count Koopula, with the box of spaghetti being clutched in its talons. Having followed the Tweeter to the castle, Mario, Luigi, Toad and Princess Toadstool reach the castle door, which is adorned with a demonic-looking door knocker; as Mario prepares to ring the castle doorbell, Luigi begins to say how he is not going into the castle, which looks to be inhabited by vampires. Scoffing at Luigi's fear, Mario goes on to ring the castle doorbell, which creates a loud ominous chime. Seconds after the castle doorbell is rung, the castle door is opened by a robed Mousigor, who Mario, Luigi, Toad and Princess Toadstool don't recognize; asking Mousigor for shelter in the castle, Princess Toadstool gets the response from Mousigor that they are welcomed to stay in the castle. After stating this, Mousigor instructs Mario, Toad, Princess Toadstool and an increasingly nervous Luigi to follow him. As Mario, Luigi, Toad and Princess Toadstool travel down a hallway of the castle, Luigi notices that the odd paintings adorning the walls of the hallway have moving eyes; alerting Mario and Princess Toadstool to this, Luigi is shocked to see the paintings have lost their moving eyes and now have blank, white ones. Mario then scoffs at Luigi's beliefs as the gang trudges down the hallway shortly behind Mousigor. Further down the hall, Mousigor stops at three doors, each one labeled with a number, going from one to two to three. Opening the door marked with a one, Mousigor instructs Princess Toadstool to enter the room and goes on to open the door marked with a two and informs the two "guys with hair lips" to enter it. After Mario and Luigi enter the room, Mousigor opens the door marked with a three, which he reveals to be Toad's room; as Toad stands at the doorway and inspects his room, Mousigor, flustered, makes the mistake of calling Toad by his name, prompting Toad to become suspicious and attack Mousigor, tearing away the part of the robe covering his face. Shoved away by Mousigor, Toad recognizes Mousigor as King Koopa's stooge and prepares to attack him again, only to see Mousigor leave the room, locking the door and trapping Toad inside of it. In the room of Mario and Luigi, Luigi is currently trying to convince Mario that there are vampires in the castle. Mario, unconvinced by Luigi's ramblings, complains of being hungry and suddenly removes a box of ravioli from his overalls, surprising Luigi. As he holds his box of ravioli, Mario explains to Luigi that this is his spare ravioli. Directly after Mario says this, a Tweeter Bat on a perch suddenly descends from a hole in the ceiling and using its fangs to puncture Mario's spare ravioli box, drains all the tomato sauce [a kid-friendly gag for blood] from the box. As the Tweeter Bat leaves through the hole it came through, Mario, now convinced that vampires are inhabiting the castle, quickly tries to help Luigi open the room door, only for Mario and Luigi to find, to their horror, that the door is locked. 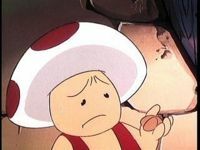 In his room, Toad is walking about, contemplating, when he stops and begins talking to a nearby gargoyle head sticking out of the wall, wishing it could talk. As Toad makes this wish, he is vaguely surprised when the gargoyle head does talk to him, telling him to go away; Toad, insulted by the gargoyle's remarks, lunges at it and knocks away the vase it was holding, which causes a portion of the wall to move, revealing a secret passage. Entering this secret passage, Toad, after some walking, notices several spy holes in the wall and looks through two of them and sees Mario and Luigi, pounding frantically on their room door. Calling out to Mario and Luigi, startling them, Toad pushes the wall forward and reveals himself to Mario and Luigi, telling them he has found a way to escape the castle. Following Toad into the secret passage, Mario and Luigi, as well as Toad, stumble into a confused Princess Toadstool's room, telling her they all need to escape immediately. Before anyone can react though, the door of the room is suddenly inexplicably forced open, revealing Count Koopula; as Count Koopula announces that his dinner is served, Mousigor appears from inside the secret passage and begins to taunt Mario, Luigi, Toad and Princess Toadstool. Panicking, Toad slams the door of the secret passage closed on Mousigor's face and, after removing the lid of a clothes shoot and jumping down it, instructs Mario, Luigi and Princess Toadstool to follow. Plummeting down the clothes shoot at high speeds, Mario, Luigi, Toad and Princess Toadstool are eventually deposited in what appears to be the castle cellar. Getting off the ground, Luigi suddenly alerts Mario, Luigi and Toad to a bizarre noise, which is being emanated by several rapidly approaching spiders resembling Snifits. Backed against a wall as these spiders approach, Princess Toadstool, seeing a nearby Piranha Plant in a pot sitting on a window's ledge, quickly grabs it; holding the Piranha Plant in front of herself, Princess Toadstool manages to goad it into blasting the spiders with its fireballs, causing them to scurry away. With the spiders gone, Princess Toadstool puts the Piranha Plant in the pot down and pats it on the head (it even curls up and blushes from the affection of Toadstool) as Mario inspects a bottle on a nearby, wooden rack; as Mario discerns that the bottle contains tomato sauce, Princess Toadstool alerts him, Luigi and Toad that something is happening outside, which prompts Mario, Luigi, Toad and Princess Toadstool to all look through a window. Outside, on a hill overshadowed by the moon, Count Koopula has four Koopa Troopas stand at attendance and tells them to gaze at the full moon; as the Koopa Troopas stare at the full moon, they suddenly mutate into monstrous creatures Luigi exclaims are Wereturtles. After the Wereturtles' transformation is complete, Count Koopula orders them to capture Mario, Luigi and Toad, but specifically tasks them not to hurt Princess Toadstool. As the Wereturtles begin to travel towards the castle, Toad gets the idea of covering the floor beneath a nearby door with tomato sauce and tells Mario, Luigi and Princess Toadstool to help him do just that. After bounding through the corridors of the castle, the Wereturtles burst through the door of the room Mario, Luigi, Toad and Princess Toadstool are in, only to slip on the puddle of tomato sauce at the bottom of the stairs; sliding across the floor, the Wereturtles crash into a nearby rack of tomato sauce bottles, which falls over on them, pinning the Wereturtles to the floor. With the Wereturtles incapacitated, Toad finds a trapdoor in the cellar floor, with a staircase in it; as Luigi voices his concerns about going down these ominous looking stairs, a Wereturtle gets to its feet and prepares to attack Mario, Luigi, Toad and Princess Toadstool. Before the Wereturtle can do anything though, Toad taunts it and throws a tomato sauce bottle at it, which lands in the Wereturtles throat, causing it to choke. With the Wereturtle distracted, Toad, Luigi, Mario and Princess Toadstool flee through the trapdoor. As Mario, Luigi, Toad and Princess Toadstool go down the stairs located under the trapdoor though, they clumsily trip and are sent tumbling down the stairs, crashing on to the floor below. Getting off the ground, Mario, Luigi, Toad and Princess Toadstool see several Goombas nearby, who are crushing tomatoes on a conveyor belt and depositing the mush they create in a large vat of tomato juice. Seeing that the Goombas, who are apparently zombies, are distracted by their work, Princess Toadstool, Luigi, Toad and Mario try to sneak by them; unfortunately, Mario decides to taste some of the Goomba's tomato sauce and, after saying that it needs more garlic, accidently quickly alerts the Goombas to his, Luigi, Toad and Princess Toadstool's presence. Attempting to run from the zombified Goombas, who are throwing tomatoes at them, Mario, Luigi, Toad and Princess Toadstool find the exit to the room blocked by Count Koopula and his Wereturtles. As Mario, Luigi, Toad and Princess Toadstool stand horrified in place, Count Koopula orders his abominable minions to take Mario, Luigi, Toad and Princess Toadstool to "Count Koopula's Torture Chamber, Wax Museum, and Dungeon of Horrors". In the bowels of Count Koopula's castle, Mario, Luigi and Toad are all strapped to various torture devices; Toad is on a stretching rack, Luigi is strapped to the wall while being tickle tortured with a feather, and Mario receives waterboarding. As Mario, Luigi and Toad writhe in agony, the nearby Count Koopula begins to taunt Princess Toadstool, saying that, soon, she will be a tomato sauce vampire like him. After making this threat to Princess Toadstool, Count Koopula drags her away, up a flight of stairs despite her saying that she hates tomatoes. As Count Koopula and Princess Toadstool leave, Mario, who is having an excessive amount of water poured on his face, begins complaining about his hatred of leaks and bemoaning his fate. As Mario complains, Mousigor enters the room and begins to make jeers at Mario; seeing Mousigor enter the room, Toad, who is being stretched on a rack, gets an idea and begins to beg Mousigor to stop his torture. Taunting Toad, Mousigor begins to spin the wheel of his rack, causing it to stretch Toad to extremes. Continuing his spinning of the rack wheel, the pawl of the ratchet mechanism breaks loose, causing the wheel to spin rapidly and violently fling Mousigor backwards and smashes into a wall, subsequently accidentally breaking it and freeing Toad. Up in the chambers of Count Koopula, Count Koopula is preparing to transform Princess Toadstool into a tomato sauce vampire, while outside of Count Koopula's room, Mario and Toad begin to discuss how they can defeat Count Koopula. At first, Toad suggest that a stake be shoved into Count Koopula's chest, though Mario misinterprets Toad and believes he means actual, edible steak. Toad eventually gets the idea to use garlic against Count Koopula, after remembering that the tomato sauce the Goombas from earlier were making had no garlic in it. Thinking Toad's idea to be great, Mario removes some garlic from his overalls and, after eating some himself, gives some to Luigi and Toad to eat. Toad, after eating the garlic. After eating the garlic, Mario, Luigi and Toad barge into Count Koopula's chambers, where Count Koopula himself is clutching Princess Toadstool in his claws, ready to transform her. As Mario yells at Count Koopula to unhand Princess Toadstool, Toad rushes forward and pulls the curtains from a nearby window, exposing the room to bright sunlight and causing Count Koopula to stumble back to his coffin, being in incredible pain. As he tumbles forward, Count Koopula finds Mario in his way and begins to threaten him, only to be hit directly in the face by Mario's breath, which reeks of garlic. Hit by Mario's garlic breath, Count Koopula begins to act crazily, stumbling into walls and the ceiling; as he tumbles around the room, Count Koopula crashes into his coffin, smashing it. Realizing he has been beaten, Count Koopula transforms into a large, bat-like version of himself and flies through a nearby window, vowing revenge on Mario, Luigi, Toad and Princess Toadstool. As Count Koopula leaves his castle, the castle itself begins to shake and crumble; as the castle collapses around them, Mario, Luigi, Princess Toadstool and Toad flee from it and into the woods of Turtlevania as the fortress cripples to the ground. After some traveling, Mario, Luigi, Toad and Princess Toadstool reach the limits of Turtlevania, which Princess Toadstool is glad to be out of. As Princess Toadstool says this, Mario, realizing it's lunch time, pulls a white box filled with cantellini out of his overalls and begins to stuff his face, much to Luigi, Toad and Princess Toadstool's amusement. No explanation for Count Koopula's supernatural powers is ever given, and in later episodes of The Super Mario Bros. Super Show!, King Koopa displays no vampiric traits at all. When Luigi says that there are cobwebs in the staircase beneath the trapdoor, a scene of the stairs is shown and no cobwebs can be seen. When Toad throws a sauce bottle on a Wereturtle, it's covered with sauce. In the next shot, it is totally clean. The eyes of the undead Goombas fluctuate between being yellow or white in color. While Mousigor is spinning the crank with Toad, Toad's vest is black. Although only four Koopa Troopas morphed into Wereturtles, six were shown when the gang was confronted by Count Koopula in the basement sauce factory. When Count Koopula instructs the Tweeter Bat to lure Mario, Luigi, Toad, and Princess Toadstool into his clutches, the heavy rain seen outside the window temporarily stops for the shot. When the gang notices the eerie castle in the distance, the large arachnid-like "legs" jutting out from the castle is missing. When the Princess pets the Piranha Plant, it turns red when Mario starts saying, "We gotta find a way outta here." In the first half of the episode, Toad has dark red spots on his cap and the Princess has dark red hair, while in the second half, the spots on Toad's cap and the Princess's hair are bright red. This is most likely due to the transition from episodes 1-13 to episodes 14-26 in production order, when character designs were being refined for digital ink and paint animation. Mario, Luigi, the Princess and Toad's skins are very inconsistent in this episode, switching from sand to bright tan. This is also the result of the animators making the transition from traditional cel animation to digital ink and paint, although this would remain a digital coloring issue throughout the rest of the series. "Count Koopula" is a parody of the story Dracula, with Count Koopula playing the part of the story's titular character, Count Dracula. Additionally, Mouser's Mousigor alter-ego appears to be a reference to Igor/Fritz from the Frankenstein series of films. Finally, Turtlevania is seemingly based upon the country of Transylvania. Wereturtles are a parody of werewolves. This is the first episode in production order to use digital ink and paint and the new, smaller captions. The bottle of tomato sauce Mario inspects in Count Koopula's cellar is dated as having been made in 1989, which is the year The Super Mario Bros. Super Show! originally aired. The song that plays in later airings of this episode is an instrumental version of Burn Baby Burn, from The Adventures of Super Mario Bros. 3.